I awoke early to go to the hospital in Tzfat for a surgical procedure to remove an area of skin cancer on my neck. The day was sunny but with a chill in the air, so I put on my warm coat. We chose to take the back road to the hospital because it is shorter and with less traffic. The hilly road curves through beautiful, panoramic vistas of the Sea of Galilee glistening in the morning sunlight. The check-in at the hospital was easy and extremely efficient and the nurses were helpful and caring. One of the most meaningful aspects of being in a hospital in Israel is that the majority of medical staff are Jewish and they understand the essence of being one nation. Consequently, they give blessings for health, for a successful procedure and also for a long life. The first time I experienced this exquisite occurrence, I thought it was just one nurse but as I later found out, they are bestowing blessings all the time. These blessings are not to be taken lightly, as the Torah explains that words of blessings have a tremendous impact in the world. It is so comforting and soul nourishing to not only be blessed by another person but also to bless another in return, thereby circulating goodwill and uplifting G-d’s name in His world. It also feels powerful to connect with other Jews through the goings on of life in Eretz HaKodesh—the Holy Land. Personally, I believe that the majority of people in Israel take life and G-d seriously and these potent blessings serve as an indicator of this fact. The doctor arrived promptly at 8 a.m. to give me an injection to numb the area and then 15 minutes later, I was ushered into the surgical area for the quick procedure and out the door soon after. Just to put your mind at ease in regards to the language, most of the hospital personnel speak English especially the doctors. Additionally, understanding that G-d provides for all our needs, all the time, one can be assured that they will be taken care of in the Land that Hashem has HIS eyes on 24/7. Driving home after the procedure, we came upon an elderly woman and a soldier needing a ride. We stopped our van to pick them up and take them where they needed to go. IT felt so joyful to be able to do a mitzvah right after having had a medical procedure, when one tends to go inside of one’s self. It was especially joyous because it was cold outside. The woman was extremely grateful, as was the soldier. We dropped the woman off at her destination and then decided to take the soldier to his base at the Northern command center of the IDF. It was out of our way, but we wanted to take him where he needed to go, to express our gratitude for all his efforts on behalf of our nation. Living in Israel engenders a deep awareness of the needs of our fellow Jews and helping becomes second nature. You could say that the favorite pastime in The Holy Land is doing mitzvot and acts of kindness which includes helping others on their way. After dropping off the soldier, we decided to take a walk in the Biriya forest which is located just minutes from the Base. Biriya is an area of religious and national significance. After the fall of Jerusalem to the Romans, those Jews not exiled, fled to the North. The area around Biriya became a major center of Torah study during the first and second centuries A.D. Biriya was resettled in 1945 by B’nei Akiva (a youth group) whose members had to fight the British in order to establish a community. In spite of the fact that the British evacuated the community several times, the youth members evaded their roadblocks, returning time and again with reinforcements, until the British finally left them alone. Since the establishment of the State of Israel, Biriya has become a major center for the forestation work in the North by the JNF (The Jewish National Fund). Additionally, it is a favorite recreation spot. 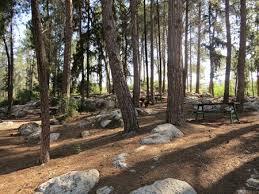 The forest boasts Pine, Terebinth, Birch, and Judas trees alongside Olive, Almond, and Cedar trees. Picnic benches dot the landscape along with huge grills and clean restrooms. The vistas overlooking the Galilee region are spectacular. 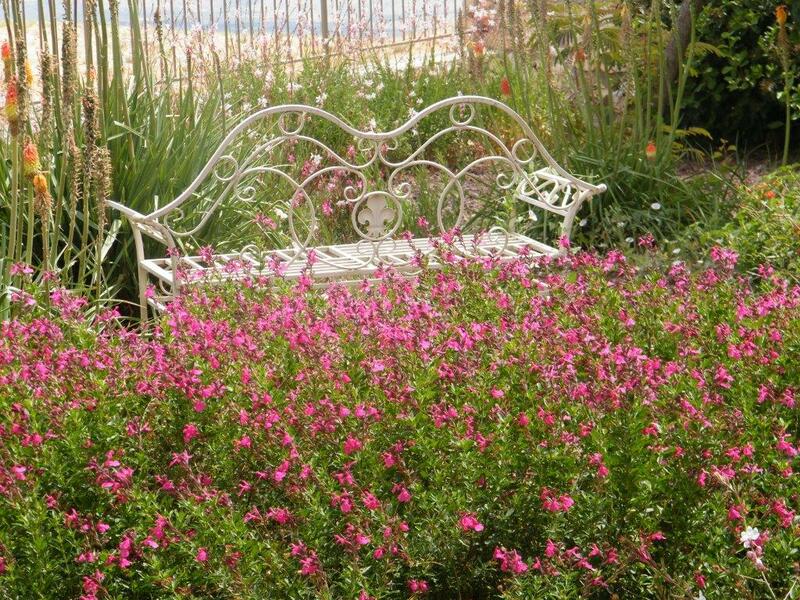 The walking path runs alongside a gorgeous meadow adorned with beautiful flowering trees and wildflowers of every color and hue growing abundantly. They completely cover the grassy expanse of land. The best feature however, about the lush green grassy meadow is the horses that are pastured there. In the spring, you can always count on there being at least one baby horse. I got out of the car with eager anticipation of catching a glimpse of the horses but I had a big surprise waiting. The horses were directly in front of the parking area roaming freely and a baby and mother were 3 feet in front of me. I was giddy with delight and I couldn’t tear myself away from staring at the beauty and power of these amazing 4-legged creatures. My husband nudged me into reality and before long we were walking along the beautiful path greeting other Jews with a hearty Shalom as we passed. On the return to our car, my husband caught sight of a large structure rising above the forest in the direction of an Air Force installation. My husband turned serious and asked me if I knew what it was. Is it the Iron Dome I answered? Yes, my husband said. The Iron Dome is a mobile, all-weather air defense system developed by RAPHAEL INDUSTRIES. It is designed to intercept short range rockets and artillery shells from 4 to 70 kilometers away. The vision of the Iron Dome took our minds back to the summer of 2006 when the Second Lebanon War was raging and katyusha rockets created havoc in Tzfat and especially the Biriya Forest, along with other places in the North. We had a home in Tzfat at the time and it was damaged by the flying shrapnel of a rocket which landed in the driveway of the house next door. It was a jarring reminder of the fragility of life and the significance of time and doing good deeds. It was a day full of contrasts: from the hospital for a procedure, to helping people on their way, to a stunning walk in a beautiful forest in a historically significant area, to staring at the Iron Dome with its incredible ability to protect and destroy. We drove home in a reflective mood, cognizant of the fact that the manifestations of the day’s events are typical of life in The Holy Land… which is a life full of contrasts and contradictions. Yet, life in Israel presents a richness and meaningfulness that enhances the palate of life. It tantalizes the taste buds of the sweetness of experiencing a life lived in constant connection with our fellow Jews. It truly enables one to SAVOR THE INDESCRIBABLE TASTE OF LIVING THE LIFE OF A JEW IN THE LAND AND HOW SWEET IT IS! A DAY IN THE LIFE OF A JEW IN THE LAND/HOW SWEET IT IS ! The day dawned like any other, with the sunshine shimmering through my bedroom window awakening me from slumber with the warmth of a motherly embrace. I had simple plans for the day; to be in the house, write, do some chores and make some phone calls…..nothing special. But then I got a phone call from a friend in need. She is around 78 years of age and she has an inoperable brain tumor. She is receiving chemo treatments and seems to be responding well. She is now and has always been a dynamic woman. She carries herself with great pride and dignity and it moves me deeply as I watch her tackle this transition in her life. She calmly requested my help with creating an organizational plan to clear out her house, as she prepares to sell it and enter the next phase of her life. She is not sure what the next phase is but she wants to get out from under the burden of her stuff. We created a plan of action and she gave me the names of friends who are ready and willing to help. This is the way it is in small town Tzfat where the community is always available to support everyone through the difficulties of life. In truth, I have never seen anything like the love, support and self sacrifice that is present in our dynamic community. And I feel so privileged to be a part of it. I left my friend’s house humbled by the courage of this woman of valor. There was no self pity, no anger; just forward movement. I felt the deepest, heartfelt gratitude to G-d that He has blessed me with the gifts and talents He did, so I can help others, especially our Jewish nation, restore order in their homes and lives. It is a privilege I do not take lightly! From there, I went to get a piece of Pizza at a great Pizza restaurant in the downtown area. As I waited for the Pizza to be warmed, I began to chat with the young 20 something year old man working there. I asked him, what it is he loves about living in Israel. I felt his whole body shake as he spoke with tremendous passion about the living, dynamic energy of the land and the people. He said, everyone is full of such LIFE FORCE….it radiates from them. He went on to give me a beautiful teaching from Rebbe Nachman about constantly praying to G-d for everything we need…everything. He said, life in Israel is all about faith and trust in G-d. His youthful passion and power and strong belief took my breath away just like seeing a gorgeous sunrise or sunset, where you gasp at the sheer beauty. He was so alive and his words reverberated throughout my heart as well as throughout the land. I pictured the energy of his fiery words soaring straight into the heavens landing right in front of G-ds throne of glory. I finished my pizza, which was my lunch and headed to our beautiful home in the Palace of the King. Later, my sweet husband grilled meat for dinner and we had leftover vegetables from Shabbat; a healthy, simple, yummy meal. Later friends came over to play word and other games, which brings lots of great conversation, laughter and joy. Then it was time to retire and call it a day. But what a day it had been! Being in the presence of a dynamic, brave, soul sister and a young vibrant, soul brother brings the sweetest, spiritual pleasures and it is so precious because we are all in Life together………ONE BIG, JEWISH FAMILY IN OUR FAMILY HOME and How Sweet It Is to both give and receive and bring Blessings into the world through our actions……uplifting the Pride of G-d’s chosen nation. A DAY IN THE LIFE OF A JEW IN THE LAND/HOW SWEET IT IS! Thursday…Yom Hamishi, I had the pleasure of going on an outing with my good friend’s teenage daughter, Tehilla…a lovely young woman in whose company I delight. Our mission was to explore, have fun, and shop a bit, but mostly to savor the gorgeous scenery along the way. It was a glorious sunny day with billowy, pure white clouds intermingled with the brilliant blue sky. We left Tzfat and traveled down the curvy road to Rosh Pina. 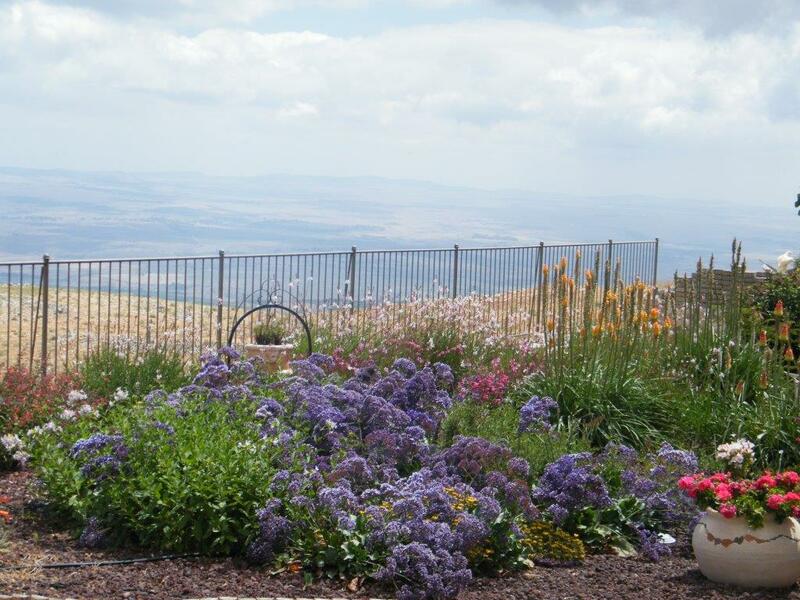 The vistas along the way look out upon the Sea of Galilee to the southeast, the fertile Hula agricultural region to the east and the Hermon mountain to the north. Each view offers a stunning panorama of HaShem’s wondrous world. The radiant sunlight highlighted the beautiful scenery and gave rise to a deep, joyful feeling. We were traveling through modern history while touching upon the pre-state pioneers’ epic sagas of the struggles of settling the land. I shared history and insights along the way with my young friend. Rosh Pina, which literally meaning cornerstone, gets its name from Psalm 118:22….”.the stone the builders despised has become the cornerstone.” This verse inspired the determined Romanian, Zionists pioneers who came in 1822 to build a village in the Galilee. They arrived with everything they needed to build their homes including the timber. 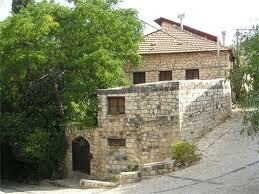 The town is very quaint and located in a picturesque setting at the foot of the mountain ridge east of Tzfat. It is the center of tourism for the region and is a gallery browser’s paradise. The town is filled with gift and clothing shops, eateries, first class bed and breakfasts, a cinema, pool and remnants of the 1880’s Romanian structures. We snooped in a darling gift shop full of handmade delights. We purchased some gifts and then headed North to Kiryat Shmona to shop in the new mall. I wanted to get my friend a graduation present and I wanted her to personally pick it out. Kiryat Shmona is the major urban center in the upper Hula valley. It is a combination of new city and old city with an open air market and new outdoor mall. Kiryat Shmona is very significant because in the aftermath of World War 1, France and Britain bickered over who should have control of this area and in the meantime bands of Arabs harassed the neighboring farm settlements. Jews attempted to protect themselves against the bands of Arabs and two defenders were killed. As a result, in the battle of Tel Hai, on the northern edge of Kiryat Shmona, its most famous resident…Joseph Trumpeldor took up arms against the Arabs. He and seven comrades fought to protect their land and country. 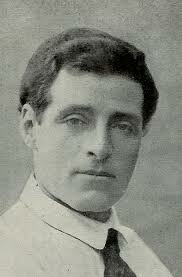 He and seven other men fell during the final battle and it is for them that Kiryat Shmona…city of eight is named. His last words were: “it is good to die for one’s country.” The heroic last stand at Tel Hai, resulted in the survival of two Jewish settlements in the area. This amazing and miraculous fact led to the League of Nations including these settlements in British-mandated Palestine and in 1948, the State of Israel. Tehilla, had never been to this town and was amazed to learn its history and appreciate what had transpired there. We shopped in the new, modern, outdoor mall. We were pleasantly surprised to see crowds of families on outings the day after Shavuot, as the kids were still out of school. Bouncy slides and other kid-friendly amusements were set up and lively music wafted out over a loud speaker. It was happy and lively to see families out and about in the Land. I personally find that Israeli’s carry joy and laughter with them. They are very affectionate and talkative and full of life. It is contageous. Tehilla found some lovely items to purchase and I accomplished my mission of finding her graduation gifts and it felt great. We meandered around the multitude of shops and savored the beautiful items in the stores. We left and headed south to a beautiful garden store to get some plants for my garden. The store is located at the entrance to the gorgeous Jewish community called Yesod HaMaala. It was the first modern Jewish community in the Hula valley. 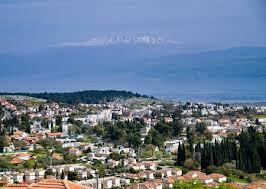 It was built in 1882 and was among a series of agricultural settlements founded during the first Aliyah. It was mostly swampland and many lives were lost in the back breaking, dangerous work of draining the swamps. Today, it is a beautiful area with lovely gardens, orchards, bed and breakfasts and gorgeous homes of all shapes, sizes and designs. It is a landscape architect’s paradise! After that lovely side trip, we headed back to Rosh Pina for lunch. Along the way, we passed the town of Hatzor. Tel Hatzor is a great place for archaeology enthusiasts as the remnants of 21 ancient cities create its mound. This ancient town was situated on the major trade route linking Egypt and Mesopotamia. It is so amazing to tap into these ancient, modern facts about our Beloved Holy Land and it puts me in touch with the eternality of our people and its rich heritage. Next stop….Rosh Pina and Café/Café…..a wonderful dairy restaurant with a great menu and oversized chairs for comfort. We had no trouble selecting from the extensive and yummy menu. Our order came quite quickly and we were delighted, as we were very hungry. Finishing up our lunch, we called it a day and headed up the long, curvy road to our home in Tzfat. The pleasures of life in Israel…our homeland knows no bounds. Life is never dull and there is always lots to do and see . There is no end to learning about our history. It fills me with deep soul satisfaction. Can you believe all of this was packed into just a few hours in our little outing? ……..history, shopping in beautiful stores in Eretz HaKodesh, yummy kosher food, stunning vistas of natural treasures with the most remarkable stories of the heroes of the pioneering days of our country along with ancient ruins connecting us to The Tanach…the Bible. What could be better than this……Target? Wal-Mart? Costco? Don’t you allow yourself to miss out on ” ANOTHER DAY IN THE LIFE OF A JEW IN THE LAND / HOW SWEET IT! I was awakened at 5:30 am by the early morning light and the cool, crisp, morning air wafting through our window which faces northeast. At this time of year, if we awaken early, we need only glance outside through our window, and glimpse the sun making its grand entrance and giving birth to the day. I generally arise between 6:30 and 7am, so today was out of the ordinary. I felt my soul beckoning me to rise and catch the spectacle of G-d’s handiwork emerging in all its splendor. Excitement permeated my being, as I hurriedly dressed and ran outside, so as not to miss the dynamic light show. The timing was perfect, as a tiny orb of orange light was beginning to expose itself to the newborn day. I was mesmerized by the profound spiritual spectacle taking place before my eyes. As I continued to watch the transformational process of the tiny orb expanding into a huge ball of brilliant, red-orange sunlight, the words of Psalm 19 flew into my mind. “The Heavens declare the glory of G-d and the expanse of the sky tells of His handiwork. 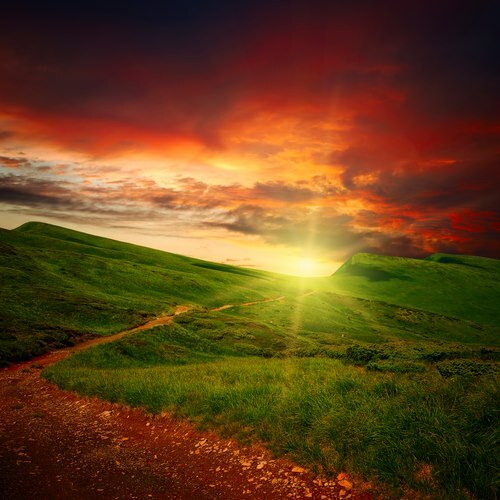 Day following day brings expressions of praise and night following night speaks of His wisdom.” Here I was standing on the ground of Eretz HaKodesh in our beautiful, colorful, blossoming garden witnessing the creation and miracle of a new day. The commentary in the Artscroll prayer book states that the daily renewed works of creation, like the rising and setting of the sun, stir mankind to speak and express G-d’s praises. I stood still with my gaze transfixed on the expanded line of sunlight spreading across the sky. From the center of the giant orb of sun, ripples of peach colored light stretched across the sky. It was truly an artist’s wonder and delight. My heart and soul were saturated with delight, as I watched the colors disappear into the daylight. From that wondrous experience, I said morning prayers with added connectivity and gratitude. Then, with renewed vigor and joy, I fixed breakfast for my husband and me. I served breakfast on the patio, so we could enjoy the beauty and warmth of the morning sunlight in our breathtakingly beautiful garden bursting with blooms in every shape and color. Afterwards, I headed out by car, to an appointment. I love driving along the curvy, winding roads of Tzfat with spectacular vistas along the way. Tzfat is located in the southern part of the Upper Galilee. 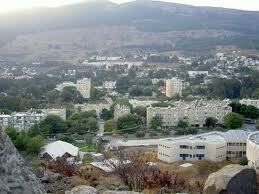 It is the highest city in Israel at 3,000 feet above sea level. I took the back roads, as opposed to going through town, because there is less traffic and I can see the gorgeous view of the Sea of Galilee. I was driving along, enjoying the view when suddenly I slammed on my brakes! I was taken by surprise at what my eyes beheld……..a very large, buckskin colored horse eating out of a very large dumpster. I cracked up laughing at the unexpected sight and went on my way knowing the horse would be taken care of. Interestingly enough, much to my surprise, Tzfat is a town with quite a few horses and I frequently see Jewish men cantering along on horseback with their payot flying in the breeze. It’s great to witness, as I love horses with a passion, because as a child, we owned several horses and I was an avid rider. After my appointment, I headed to one of the grocery stores in Tzfat where everything in the store is Kosher. I just had a few items to get and the store wasn’t crowded, Thank G-d! One of the best things about shopping in Israeli grocery stores is the blessings for good health that you receive from your checkout clerk when you pay for your cheese, meat or baked goods. “To life and health” they say or “may you eat it in good health.” The Sages teach us that no Blessing is to be taken lightly! It is so beautiful to receive a blessing by another Jew who is essentially serving the public in their job capacity….and they say it with such emphasis and I know it is not just empty words but powerful words that leave you feeling very special. When checking out also, many times, the cashier will give blessings for life, and health and a good day. If it is close to Shabbat, practically everyone in the store will say, “Shabbat Shalom.” So, we see that every mundane act we do in Israel is deeply connected to the Klal and brings great Blessings to the world. After shopping, I headed home for my next adventure. As I was taking a curve on the return by the same route I came, I slowed down a bit. A lady emerged from the side of the road and ran up to the car. She opened the door and without question or hesitation got in. This was not a surprise for me or a new experience as it had happened before. Many people across Israel do not have cars and they hitch-hike or tramp as it is called here in Israel. It is quite common and generally safe especially in Tzfat. I felt honored to be able to help her on her way. I value each mitzvah as a precious jeweled stone building up the strength and foundations of our nation in the Holy Land. I arrived home and walked into our beautiful one level home that we built on a dunam (one quarter acre) of land, with the groceries. My wonderful husband came to help carry them and said, How would you like to go into town for Pizza? Great idea, I said and so off we went on his 3 wheeled scooter into town for yummy Pizza. I love riding on the scooter with my husband with the wind in our face and feeling one with the sky and earth. Plus I love that parking is so easy with a scooter…you can park anywhere. The pizza was great….thin crust, cheesy and flavorful….my favorite. After finishing, we meandered down the main shopping area just for the pleasure of it and then headed home. I worked a bit in the garden, did some household chores, fixed dinner and then got an unexpected call about a surprise guest. A young woman, an IDF soldier that we know, needed a place to sleep over. She has been detained on a job assignment. She would be arriving late, so we put water and goodies in her room including candies on her pillow and went to bed. I went to sleep with profound gratitude for all the Blessings G-D CONTINUOUSLY SHOWERS UPON US ESPECIALLY IN HIS BELOVED GARDEN WHERE HIS EYES ARE CONSTANTLY ON US WITH NO INTERVENING FORCES. JUST ANOTHER DAY IN THE LIFE OF A JEW IN THE LAND/HOW SWEET IT IS. Today, I watched the sun rise over the Galilee. I awakened at 5 a.m., arose from my bed, and opened the door of the balcony off the bedroom. The pale first-light of morning beckoned me to take in its beauty. I knew even in my sleepy state, that if I could awaken myself and be patient, I would be privy to witness, right before my wondrous eyes, the birth of the new day. The birthing process took 30 minutes and like any birth process, its miracle and wonder captivated both my heart and soul. I eagerly awaited the arrival of the brilliant ball of fire that I knew would soon emerge. 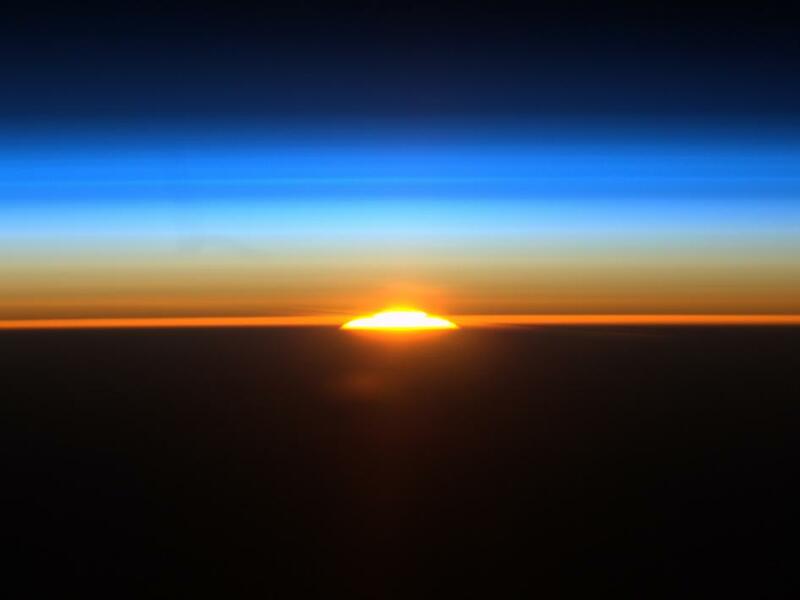 The sky changed from a hint of pink to light orange to a brilliant white and then a ball of fire emerged over the horizon and before I knew it, the first morning of Chodesh Tammuz was swiftly on its way. Tammuz is the month related to eyesight and vision so it was a true joy that G-d blessed me with the opportunity to witness this amazing sight. I relished being awakened so early and decided to make full use of my day. It has been taught by our Sages, that it is auspicious to greet the new day with morning prayer, so this is exactly what I did. Our Sages also taught, that the day/days of the new moon impact the entire cosmos creating a spiritual reality that touches all of creation. After praying and eating breakfast, I decided to drive to a woodsy area, and walk along the paved path. I parked the car in the shady area of the historic Biriya fortress situated in the Biriya forest. The Biriya forest is the largest planted forest in the Galilee situated on slopes descending east from Tzfat to Rosh Pina and Hatzor. The forest is filled with gorgeous Jerusalem Pine trees as well as other varieties. Biriya forest is equipped with sturdy picnic tables and barbecue grills nestled amidst the trees. The walking trail is surrounded by towering pines with colorful wild flowers and flowering shrubs intermingled with the trees to create an exquisite mosaic of vibrant color and texture. There was a profusion of yellow flowering Spanish Broom. As I walked along the path, I was greeted and escorted by beautiful butterflies dancing in merriment. I was serenaded by a cadre of birds hidden in the dense green foliage. The chirping, singing, twittering sounds of the birdsong were a musical event I had not been privy to for a long time. My heart responded to the symphony with tears of gratitude. A fox digging on the hillside lifted his head, looked right into my eyes as if to welcome me, and then turned aside to go about his business. After the brisk walk, I meandered through the forest and sought out a picnic table in order to sit and reflect upon life and the kindness and loving ways of our Creator, who gave us the gift of nature to care for, delight in and restore our soul. I found the perfect table nestled in the shade, surrounded by trees of all shapes and sizes. I drank in the sights and sounds of nature as if parched from years of nature deprivation. My heart and soul soared like the birds flying through the myriad of trees. The pine trees perfumed the air and awakened my sense of smell to the freshness of nature. The contrast of blue sky and green leafed trees reminded me of the balance of heaven and earth….spiritual and physical. It must have been the combination of the cosmic energy of Rosh Chodesh, and the deep inner delight of this exquisite day which seemed to take hold of me, and rouse my soul to cry out to HaKadosh Baruch Hu for all of Am Yisroel. I took the opportunity to request of Him to give us the balance of both spiritual and physical. I cried out to Him that our Torah should be as deeply embedded in our heart, mind and soul as the roots of the giant trees which surrounded me. I prayed that our words of Tefillah would be as sweet and clear as the birdsong of the forest birds. I cried out that our mitzvot would be as fragrant as the pine trees and as great in number as their seeds. I cried out that we merit long days and years to experience and savor the majesty, might and wonder of OUR PRECIOUS HOLY LAND! A perfect way to spend a perfect Rosh Chodesh Day, in the Holy Land, in the Holy city of Tzfat.